Ibadan has several five star hotels like the Premier Hotel (located on a hill with fantastic view of the city), Kakanfo Inn, University of Ibadan Guest House etc. 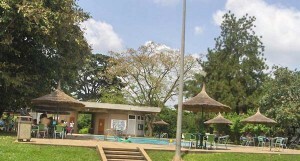 But for our International guests, we would suggest staying at the International Guest House within the campus of IITA. This has the distinct advantage of zero transport cost to the conference venue as well as access to standard recreational facilities like restaurant, bars, swimming pool, fishing lake, squash and tennis courts. Security is also high within the campus, which is set in a forest environment. Rates are between 115 USD to 150 USD for rooms ranging from single to 2 bedroom flatlets and on weekends drops to 60 USD to 100 USD. If we are booking as a group then the rates are about 10 USD more but includes buffet lunch and dinner. Breakfast is included in all the prices. The hotels outside the campus with descent accomodation usually starts from about 80 USD and you have to factor in a taxi which would be about 30 USD.